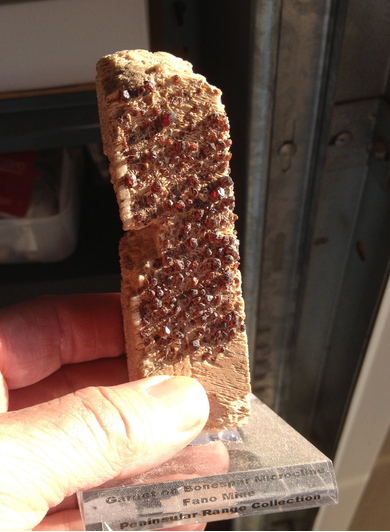 A rare-earth-element (REE)-gemstone-specimen producing pegmatite occurrence/mine located in the NW¼SW¼ Sec. 33, T6S, R2E, SBM, 2.3 km (1.4 miles) E of Little Cahuilla Mountain (coordinates of record), 3.3 km (2.0 miles) N of Cahuilla Mountain (coordinates of record) and 8.3 km (5.1 miles) NNW of Cahuilla (town), on private (patented) land within a National Forest. MRDS database stated accuracy for this location is 100 meters. 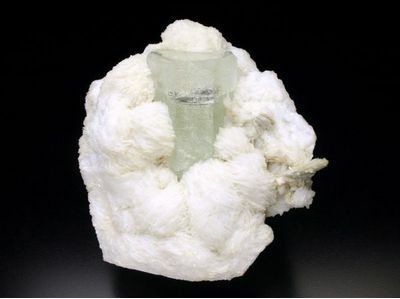 The deposit was first discovered by Bert Simmons in 1902, and is best known for its production of well-crystallized schorl and gem aquamarine, as well as pink tourmaline and spodumene. Two contiguous lode mining claims (Big Pink and Little Blue lodes; MS 4800) are commonly referred to as the Fano Mine, and aggregate approximately 37.54 acres. 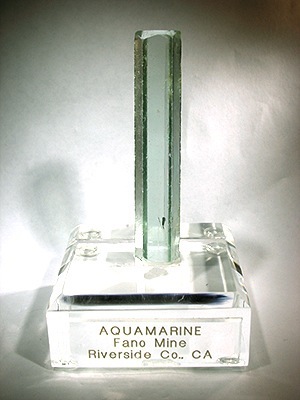 The property is private land, patented January 29th, 1912 by the Fano Kunzite Tourmaline Mining company. Geology/Mineralogy: The ore body is a pegmatite dike that strikes NW and dips 20SW at a width of 2.44 meters. Local rocks include Mesozoic gabbroic rocks, unit 2 (undivided) and/or pre-Cenozoic granitic and metamorphic rocks undivided. Workings: Workings include surface and underground openings. The deposit has been developed by numerous surface cuts, trenches, and minor underground drifts along the paystreak. Reference: Fisher, Daniel Jerome (1944), Some southern California pegmatites: unpublished manuscript, USGS: 75. Reference: Kunz, G. F. 1905. Gems, jeweler's materials, and ornamental stones of California. California State Mining Bureau bulletin 37: p. 121-22. Reference: Rocks & Minerals (1988): 63: 441. Reference: Gochenour, K. 1988. 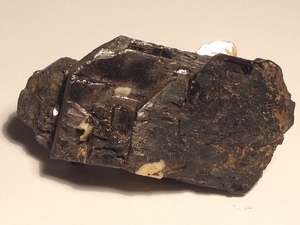 Black Tourmaline from Little Cahuilla Mountain, Riverside County, California. Rocks and Minerals, 63 (6): p. 440-444.; Jesse Fisher (2011) Mines and Minerals of the Southern California Pegmatite Province. Rocks & Minerals 86:14-34. Reference: Fisher, Daniel Jerome (1944), Some southern California pegmatites: unpublished manuscript, USGS: 75; Murdoch, Joseph & Robert W. Webb (1966), Minerals of California, Centennial Volume (1866-1966): California Division Mines & Geology Bulletin 189: 155. Description: 30% Ta-rich, high in Mn and poor in Fe. 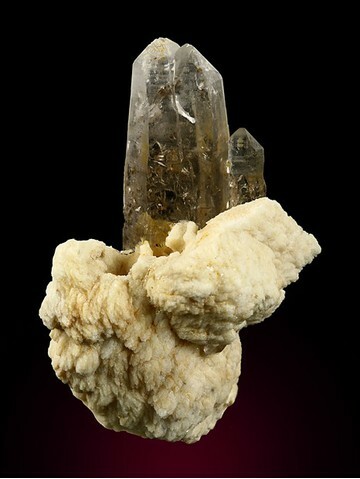 Occurs as fan-shaped masses of radiating crystals up to 3 inches (7.5 cm) in an albite-quartz mixture in pegmatite. Reference: Pemberton, H. Earl (1983), Minerals of California; Van Nostrand Reinholt Press: 177. Reference: Rocks & Min.:63:441. 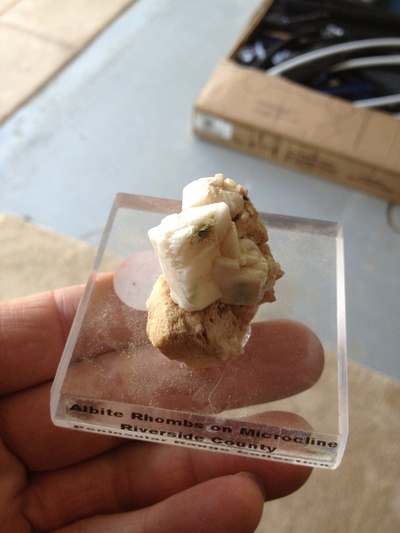 ; Jesse Fisher (2011) Mines and Minerals of the Southern California Pegmatite Province. Rocks & Minerals 86:14-34. Reference: Cal Div of Mines & Geo Bulletin 189 " Minerals of California"
Description: Occurs in lithia-pegmatite. Suibstantial production of fine crystals. Reference: Kunz, G. F. 1905. 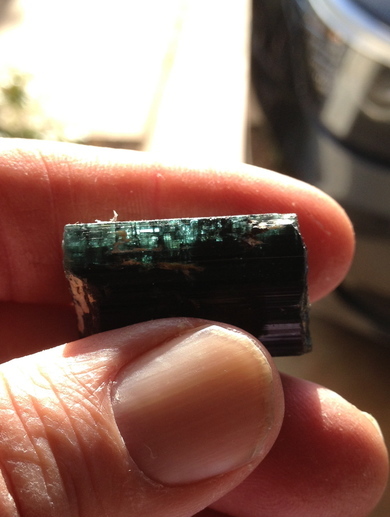 Gems, jeweler's materials, and ornamental stones of California. California State Mining Bureau bulletin 37: p. 121-22.; Jesse Fisher (2011) Mines and Minerals of the Southern California Pegmatite Province. Rocks & Minerals 86:14-34. Description: Granitic and metamorphic rocks, mostly gneiss and other metamorphic rocks injected by granitic rocks. Mesozoic to Precambrian. Comments: Southern California, Mojave Desert, Sierra Nevada, central California Coast Ranges Original map source: Saucedo, G.J., Bedford, D.R., Raines, G.L., Miller, R.J., and Wentworth, C.M., 2000, GIS Data for the Geologic Map of California, California Department of Conservation, Division of Mines and Geology, CD-ROM 2000-07, scale 1:750,000. Kunz, G. F. (1905), Gems, jeweler's materials, and ornamental stones of California. California State Mining Bureau bulletin 37: 121-123. Merrill, Frederick James Hamilton (1919), Los Angeles, Orange and Riverside Counties: California Mining Bureau (Report 15): 15: 576. 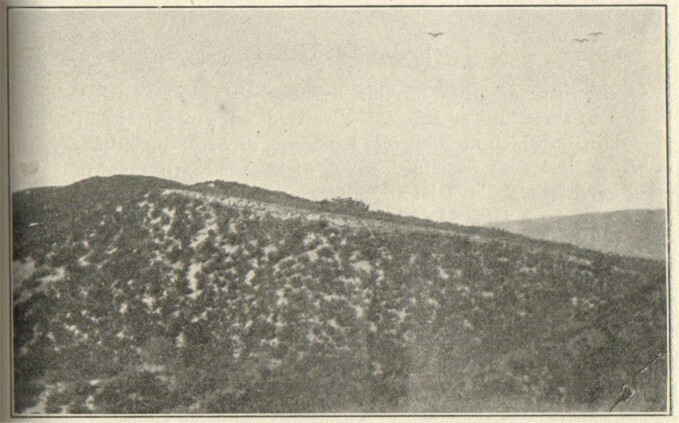 Tucker, W. Burling & Reid J. Sampson (1929), Riverside County: California Journal of Mines and Geology, California Mining Bureau. (Report 25): 25: 508. Fisher, Daniel Jerome (1944), Some southern California pegmatites: unpublished manuscript, USGS: 68, 75. Murdoch, Joseph & Webb, Robert W. (1966), Minerals of California, Centennial Volume (1866-1966): California Division Mines & Geology Bulletin 189: 63, 103, 155, 242, 265, 346. Rynerson, F. J. (1967), Exploring and Mining Gems & Gold in the West; Chapter 17, 118-120: Naturegraph Publishers, Inc., Happy Camp, California. California Division of Mines and Geology Open-File Report 77-14 (1977): 251-253. Pemberton, H. Earl (1983), Minerals of California; Van Nostrand Reinholt Press: 177, 179, 310, 348, 388, 430, 446, 503. 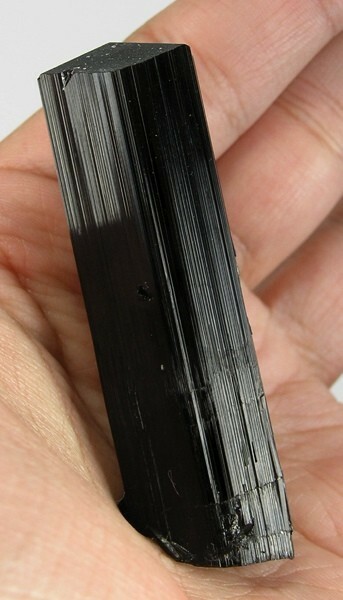 Gochenour, K. (1988), Black Tourmaline from Little Cahuilla Mountain, Riverside County, California. Rocks and Minerals: 63(6): 440-444. USGS (2005), Mineral Resources Data System (MRDS): U.S. Geological Survey, Reston, Virginia, loc. file ID #10096069 & 10139888. U.S. Bureau of Mines (1995), Minerals Availability System/Mineral Industry Location System (MAS/MILS): file #0060650072.